Excellent movie that shows the sad condition some children have to live in. This is an absolutely wonderful movie. I can find no fault with it. It only saddens me that all children do not have the care they need and deserve. Must buy DVD. I just love this movie so much. I gave this Sandra Bullock movie a five star rating because it was so touching and so close to a real life story that you can imagine. I liked the whole point to the movie. Sandra Bullock was Amazing in this movie the way she portrayed her role. I love the Fact that she doesn't let her friends make fun of Michael. The way that Michael is in the part with all the redneck really got to me that there is still people out there that act this way. When the young man said he had never had a bed I lost it..how unfair life can be...thankfully there are people out there that care! Sandra Bullock nailed this role!! !Beautifully cast-they really got this RIGHT!!! Well done to all involved in this endeavour-it will be epic!!! Great movie. Can't believe those people who thought this was a bad movie. What made it extra special is that it's a true story. How many people out there, no matter how good hearted, will take in a 300lb homeless black boy? great story. great acting. a worthwhile watch definitely. the movie was great, it was very touching. I'M SHOCKED that Bullock had a side like that but the way she acted was as if it was really happening. THIS MOVIE WAS GOOOOD ! We thought it was one of the best family movies we've seen in a long time. The acting by all was superb and the story really good - may encourage people to reach out to those less fortunate with time or whatever God has given them. The message was to me was when you give generously from what you have been given by God without expecting any return you receive so much more than you ever imagined. While the movie told a touching story, I felt the movie was a bit flat. There was no real dialogue, just short scenes with quick one-liners. Bullock was awful - sad that she won an award for this performance. It was a wonderful heartfelt family movie. To the original people who inspired this story God Bless you all. For the characters who played there parts in the movie excellent entertainment. Thank You all. BOOORRRINNNGGG!!!! Amarican "feel good" story garbage. I felt this movie was a string of sound bites rather than a real movie, with a moving plot and character development. In addition, I cannot believe Sandra Bullock won for best actress - she shoould be arrested for robbery. She was in and out or her southern accent throughtout the entire movie - sometimes in mid sentence. A very dissapointing film!!!! amazing must see gotta go like today it made me cry a bit amazing stiry line wonder if God had a say in this to the director it s amzing how God can tell people what to do in there mind but its there choice if they wanna follow the way he does. its crzy. if anyone agrees with me go to face book and serch up springs church nerv its a youth group that talks about the spirit power and mind and on how u can still do bad things and belive and him at the same time God dosent care he just wants to proctect you to make better choices so comr out and join us on firday nights at 730.
great story, very touching watched it flying on air canada today. Great story, great acting on everyone's part. I only hope this happens more than we think in the world ! I don't get the big deal. Very predictable story. Not Oscar worthy and Sandra gives her usual basic preformance. She's the same in every movie. This movie is an amazing and inspiration story that serves a message that both avatar and green zone lack. It's raw perspective gives the viewers an inside look of a man who had a troublesome adolescence. This movie proves, "It doesn't matter where you come from, but where you're going." It is excellent and I encourage people who have not seen it yet to watch it immeadiately. We should all learn from this true story, and society as a whole would be so much better!! I laughed more than I thought I would. Good movie. A very very inspiratinal movie. This is a wonderful, moving story about what we can accomplish when we hold compassion dear and also have the money to support an inner city teen. Sandra Bullock was good in this movie, that being said, I'm surprised she is getting all the awards. Meryl Streep should be winning for Julie and Julia, hands down. Did the Hollywood Foreign Press or members of SAG see "All About Steve?" It was horrendous! HOR REN DOUS! I guess people are willing to overlook Sandra's shameful, overacted, awful comedy and give her acclaim for simply doing her job in this movie: believabley telling the story. Lot of fluff. Division I football is a nasty business. I'm sure the investigation of the Ole Miss relationship was a little more intense than protreyed. Movie was long and predictable in spots, based on what is out there to compete, it was OK. I heard about the movie through recommendations. It is the best movie I saw in 2009. This movie is fantastic! So inspiring! We need more of this type of movie! A well written and directed movie that gets to the core of being given a chance and thriving within the right environment. Bullock was excellent and it was an inspiring movie. 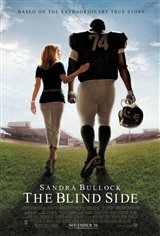 Sandra Bullock made this a great movie, even made inclusion of college coaches believable; actor playing Oher did an excellent job as well. This is one of the best movie ever. I watched it three times already! Its just so amazing how a decision made in a few seconds can change a person's life completely. This movie makes me feel and think a lot. I saw this movie at the theatre last night with God Holy Spirit...amazing movie!!! I only wish the "Christians" in this movie had mentioned "Jesus" or "Yashuah" at least once in the movie, so every non-religionized/non-"christianized" person who sees it would know which God they're talking about! (I give the movie 5 out of 5, especially since they include realistic swearing/cursing words) I hope and pray to watch it again, but this time with my new gf, with possibly her almost teen son.. I immediately wanted to watch it again! Everyone I recommended it to loved it as well! Best movie I have seen in years. I love Sandra and Quinton did a great job as well. This movie was fantastic - saw it compliments of Tribute. I have been recommending it to everyone I talk to about movies. The only drawback is that it is about 15 minutes too long. Otherwise - GO SEE IT!!! This movie was fantastic! It was touching and moving but also had a side of comedy to it that people in the theater were laughing out loud to! Great job!! !